This is an easy meal you can prep in 5 minutes flat, and it will cook itself in the crock. The family loved it! My husband likes to add a little hot sauce to it. I like it plain myself. Serves 6. Spray the crock with some nonstick spray. 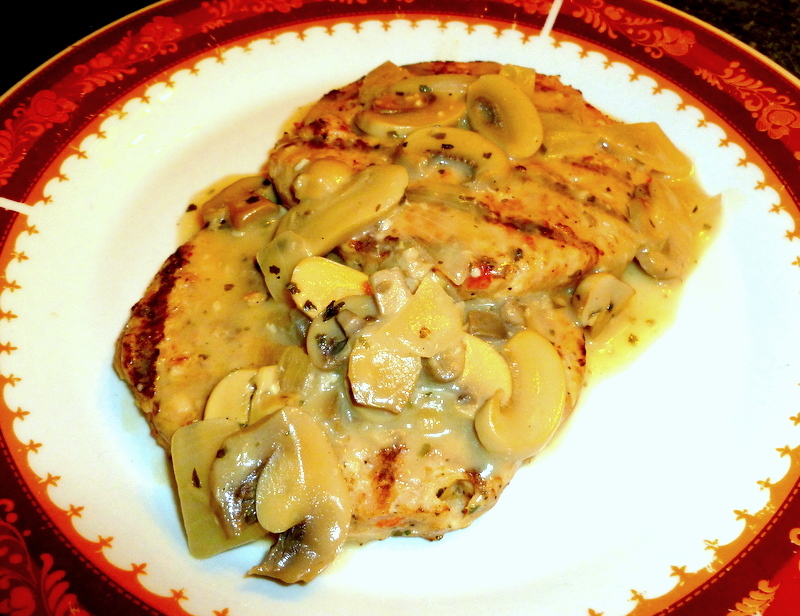 Pour in the chicken soup, mushrooms (do not drain, include liquid! ), minced garlic, onion and parsley. With a wire whisk, blend everything together. Add the softened cream cheese (to soften cream cheese, simply leave out on the counter till room temperature). Whisk cheese into the mixture. 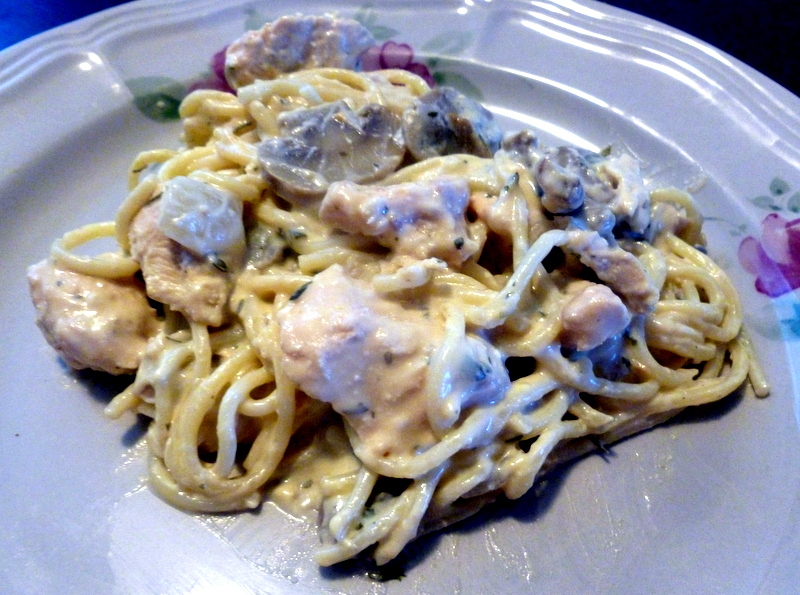 It may be a little lumpy, that is ok.
Now add your chicken, and using a spatula or a big spoon, mix everything together. Cover and cook on low for 6 hours, on high for 4. Halfway through cooking, use your wire whisk to blend the cream cheese right in. It should blend in smooth by now. When you are about to serve, prepare the pasta according to box directions. Drain, and add into the sauce in the crock. Mix well, and serve. Delicious and filling. About 12 points a serving! 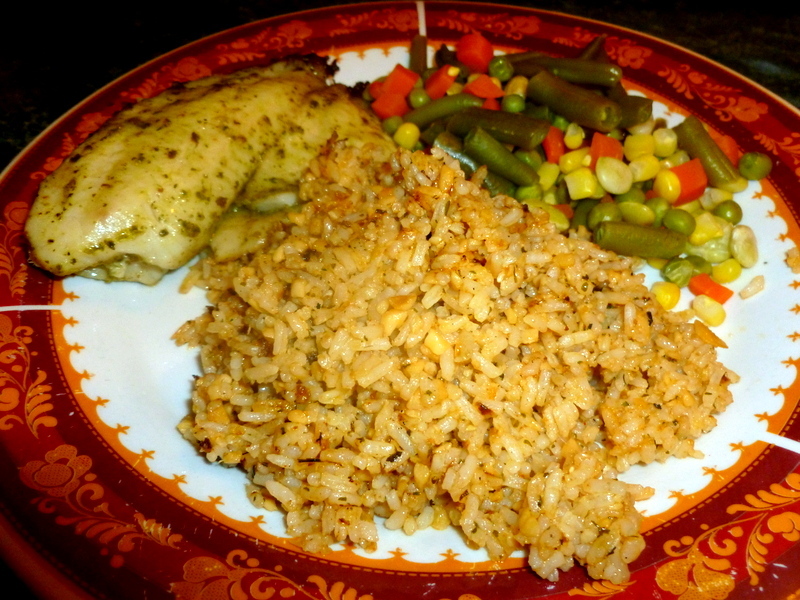 I realized I have never put up my personal recipe for Garlic Fried Rice! 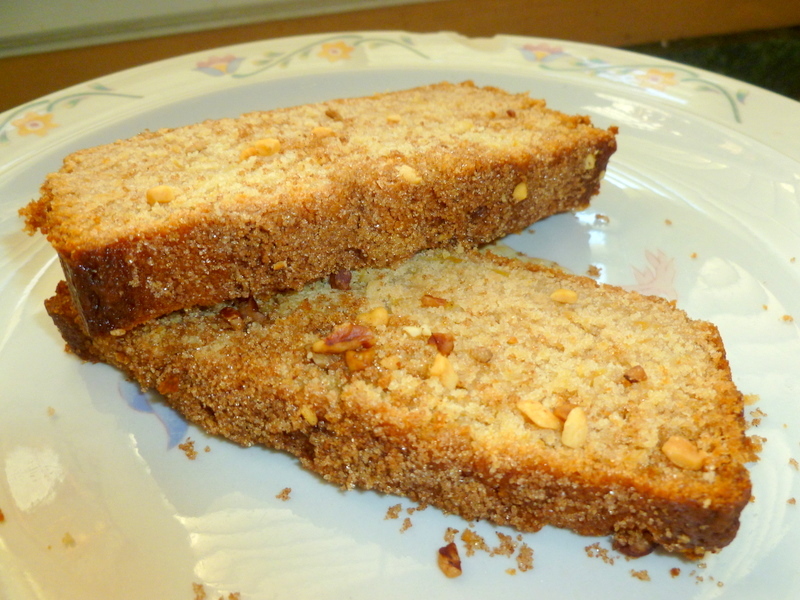 It is simple to make, YUMMY and appetizing. A perfect complement for your main dish. Try this, it's a winner! Serves 6. Melt butter in a pot and throw in your garlic and saute till just lightly golden brown. Add the cooked rice and thoroughly mix the butter and garlic throughout the rice. Add then the paprika and parsley, and mix thoroughly. Let sit on medium heat for a couple minutes and scrape the bottom of the pot to get the little bits of crust off, and mix that into the rice. Repeat as much as you wish, depends on your taste. Serve! About 8 points a serving. It is good! Tip: For an all in one dish, simply add chopped meat of your choice and veggies. Quick dinner! I whipped this up on a day that I was wanting a home-cooked meal, but had no time to cook. We were going out for the day but wanted to come home and have a fast, healthy dinner. This is the answer. Serves 4. Mix together the paprika, garlic powder, onion powder and black pepper. Rub all over the chicken breasts, making sure to coat well. Spray a frying pan with nonstick spray and set on high heat. When pan is hot enough, put all four breasts in it to sear for about 3 minutes. To check if pan is hot enough, I put a drop of water in, and if it dances and fizzes out, it's hot enough. Flip the chicken and sear the other side. You want it just slightly blackened. Spray the crock with nonstick spray. 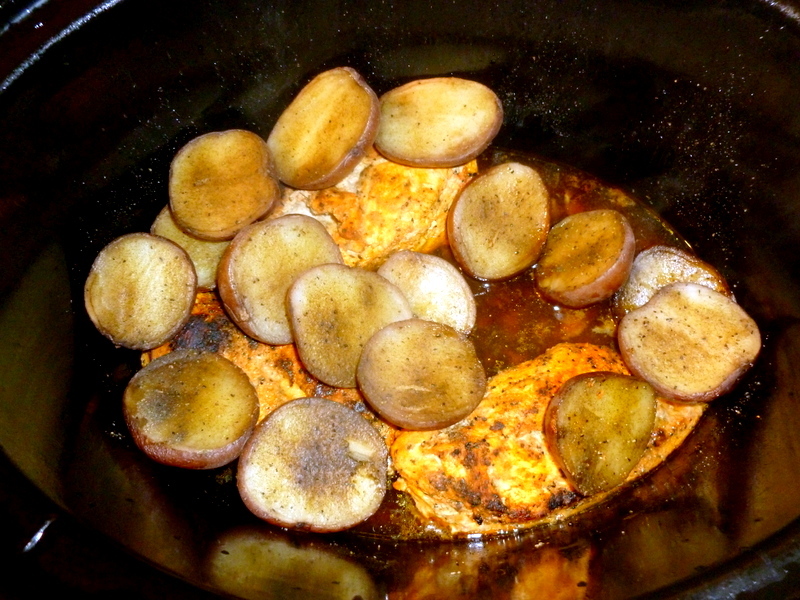 Set in the seared chicken breasts. 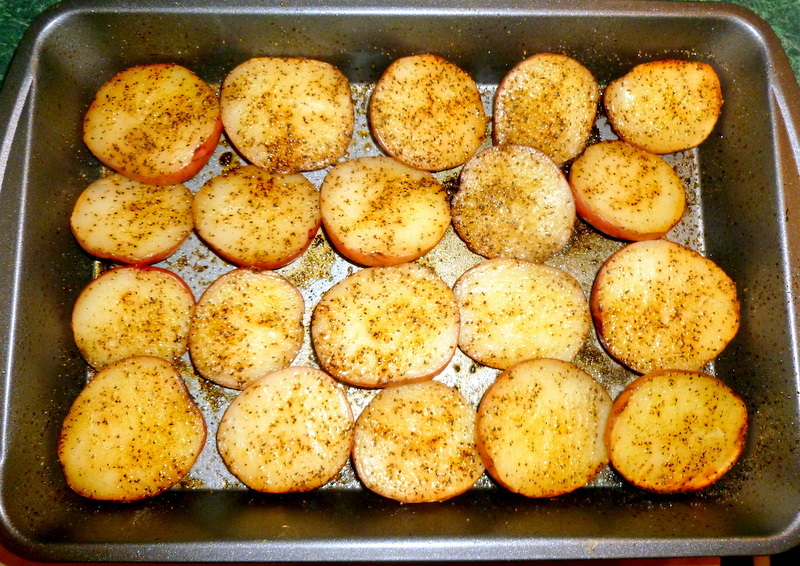 Put the potatoes on top and sprinkle the paprika mix on top. Cover and cook on low for 6 hours, high for 4 hours. Dinner is ready! About 9 points per serving. A serving size would be a chicken breast and 3 potatoes. Yummy! 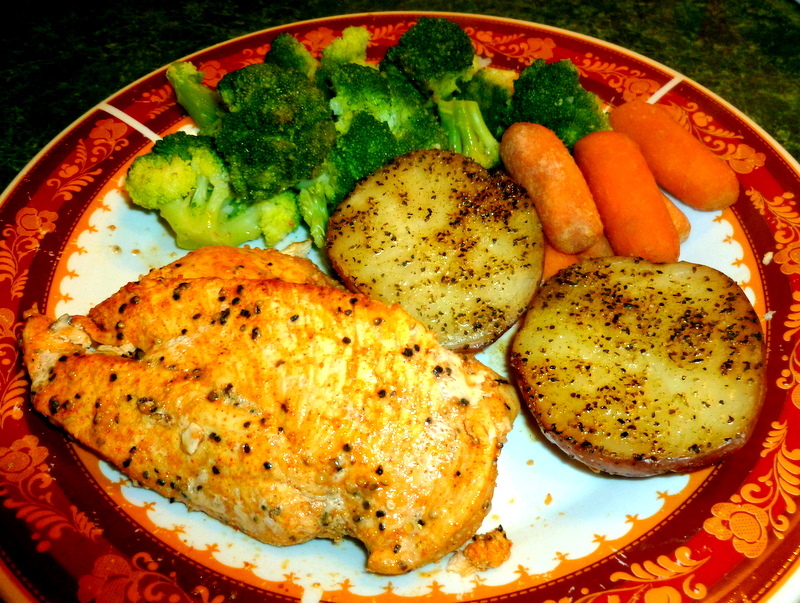 Simple, easy and nutritious meal! I simply mix everything in the crockpot before bed and my family wakes up to a divine breakfast! Serves 8. Spray the crock with nonstick spray. 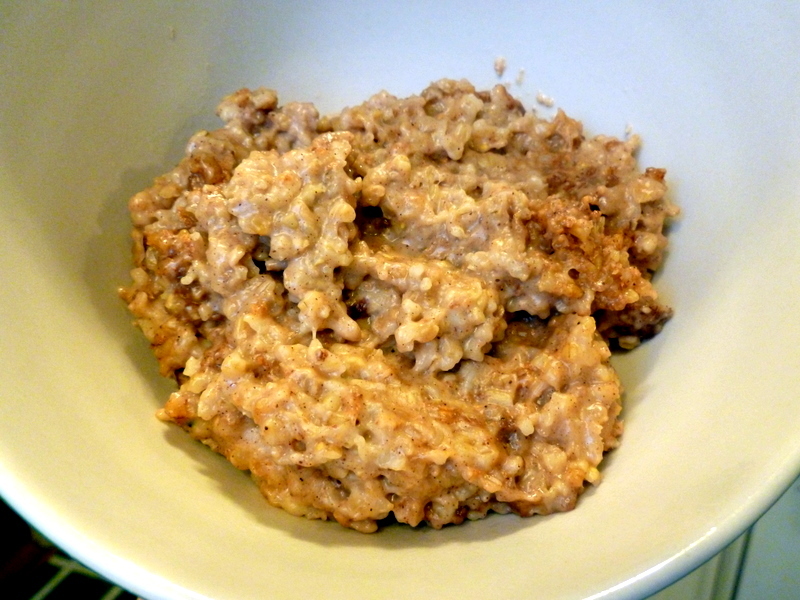 Now mix together in the crock the oats, brown sugar and cinnamon. Make sure there aren't any sugar lumps. Add the milk and water, and stir well. Cook on low for 6-8 hours. Go to bed. When you wake up, yummies await! Stir well before serving. About 10 points a serving! If you use fat free evaporated milk it will be down to 8 points! Have at it! Easy and healthy are 2 things that matter to me. Busy mommies always want to feed their families healthy, nutritious food - while watching their waistline! Serves 4. Cook rice according to package directions. Set aside. Personally, I just use Minute Rice, but us what you prefer. In a mixing bowl, throw together the red kidney beans, green chiles, salmon, cumin and red pepper flakes. Mix well. 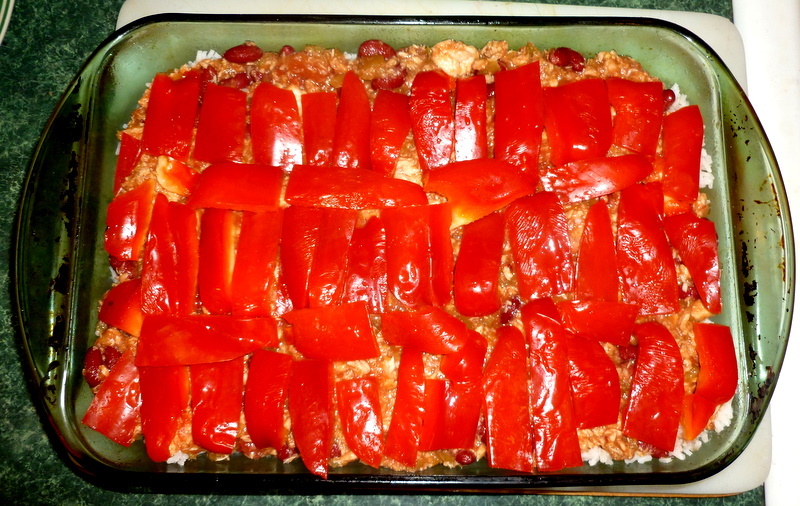 Spray an oven-proof casserole dish with nonstick spray and spread the rice over the bottom. Now pour the bean mixture on top and even it out. Lay the chopped bell pepper on top, like so. 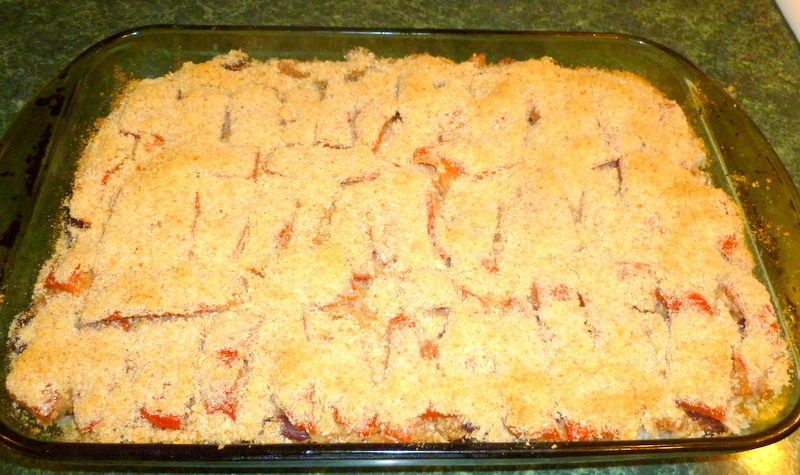 In a bowl, mix together the bread crumbs, parmesan cheese and parsley, and sprinkle over the red peppers. Cover top with an oven-proof lid or use foil to cover. Bake in a preheated 400F oven for about a half hour. And it is done. About 9 points a serving! Healthy, tasty and yummy! All I can say is, this is a winner! Super good and super addicting. Literally can't stop eating it. People who don't like peaches will LOVE this! Warning over. Ok, this serves 12. In a mixing bowl, cream the butter. Add the sugar and mix well for about a minute. Add the eggs and vanilla, and mix thoroughly. Add the flour. I don't dump the flour in all at once, I do it in thirds, so it doesn't make a huge dusty mess. Scrape the sides of the bowl with a spatula in between mixing to make sure everything gets blended well. When everything is blended, it's gonna be a little stiff. Add the mashed peaches and blend very well, making sure the peaches are incorporated and there are no big lumps. Mix about 2 minutes on medium with an electric mixer. Spray a loaf pan with nonstick spray and pour batter in. Set in the middle rack of a preheated 350F oven and bake for about 20-25 minutes. Check to see if the top isn't liquidy anymore and just a little firm. 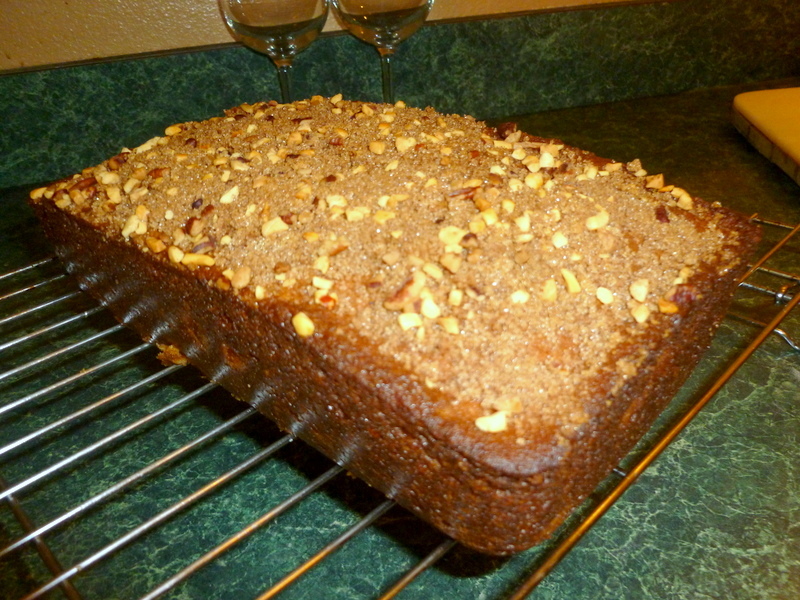 To make the topping, just mix together in a small bowl the brown sugar, cinnamon and chopped nuts. 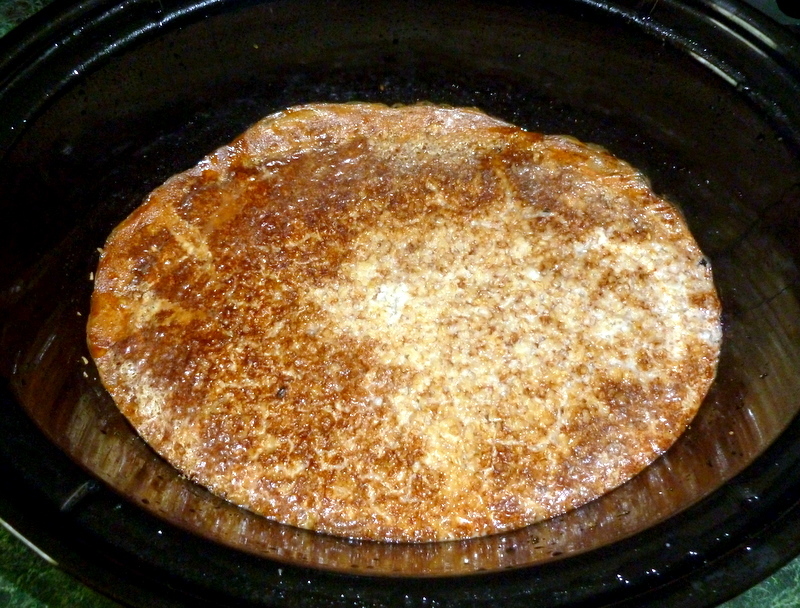 Sprinkle evenly over the half-baked top of the bread. Bake for about 25-30 minutes more. To check for doneness, stick a fork into the bread. If it comes out clean, it is done. Let cool for a few minutes in the pan, then loosen edges with a spatula. Turn over onto a rack to finish cooling. Let cool a couple hours at least. And you are good to go! Has a wonderful, mild sweet peach flavor and light texture. Only 7 points a slice too! Good as a snack or dessert! Love it like we do! We love fish made this way! 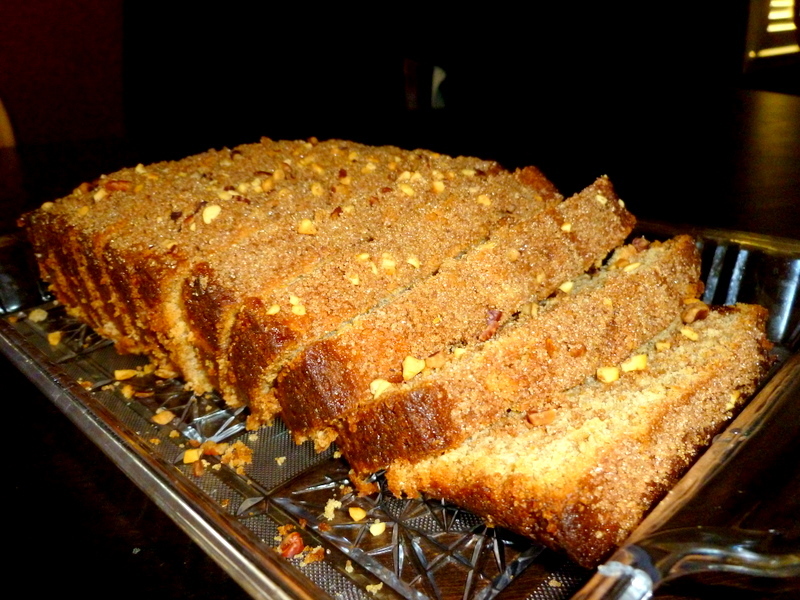 It has an almost creamy texture, with a little bit of crunch from the crust. Not bland at all! Trust me! Serves 6. Pat the fish dry with a paper towel. Pour the olive oil over the fish, making sure to coat evenly. In a bowl, mix together the breadcrumbs, Johnny's Garlic Seasoning and Parmesan cheese. In case you are wondering what Johnny's Seasoning is, this is it. I got this from Costco, costs about $ 6.62. It's a big jar, and a little goes a long way. Can you tell I like buying things at Costco? Hah, yes, I do. 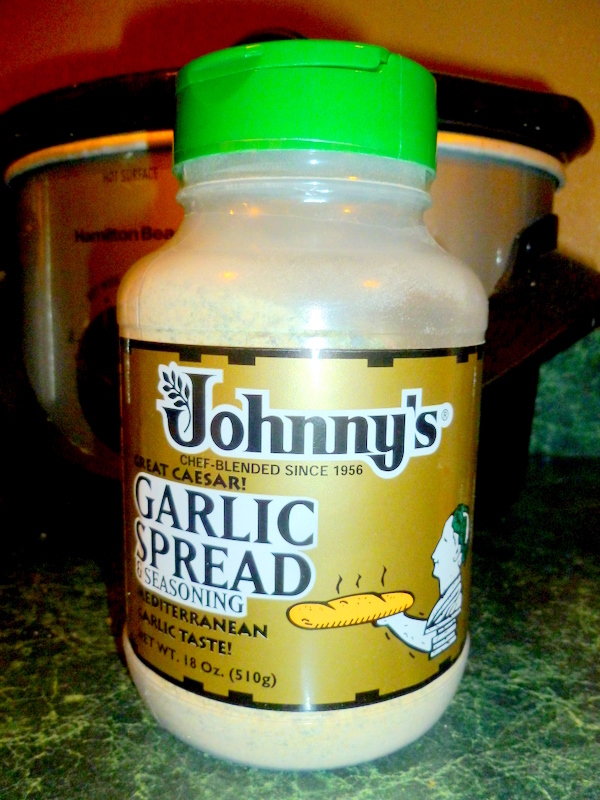 If you can't find this at your local grocery store, you can just substitute regular garlic powder. This just has a unique taste and the garlic flavor is pretty pronounced. Now coat the fish thoroughly with the mixture. 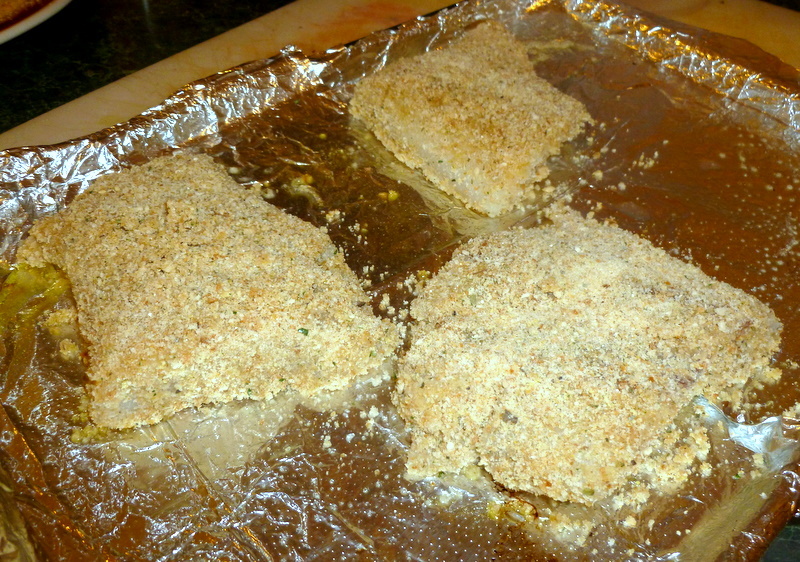 Let the fish sit for about 10 minutes so the breading sets, and lay on a cookie sheet or baking pan. I personally like to line a cookie sheet in foil, then spray it with nonstick spray. Makes it easier to clean up afterwards. Like so. Bake in a preheated 425F oven. 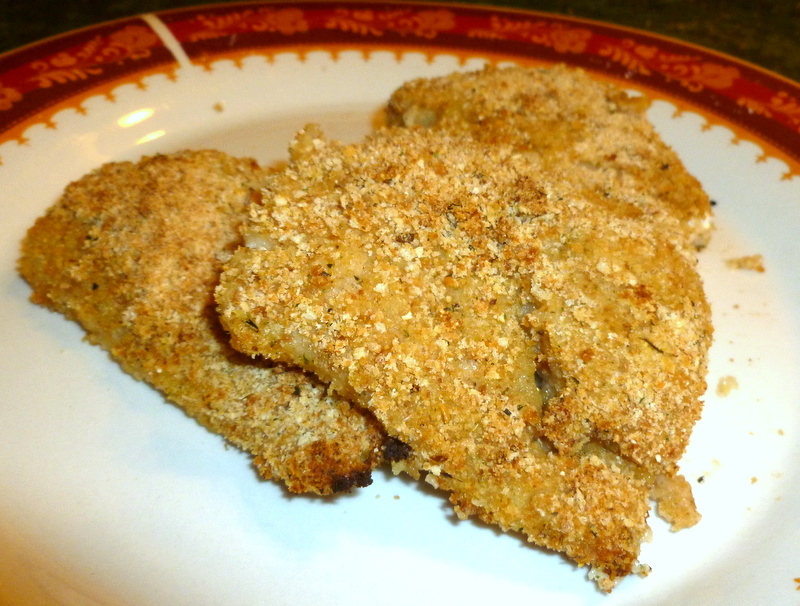 The secret of good, non-soggy, crisp oven fried fish is baking it in a very hot oven. Get it good and hot. Now stick it in, and bake for about 15-20 minutes. And you are done. About 3 points a serving. Awesome! 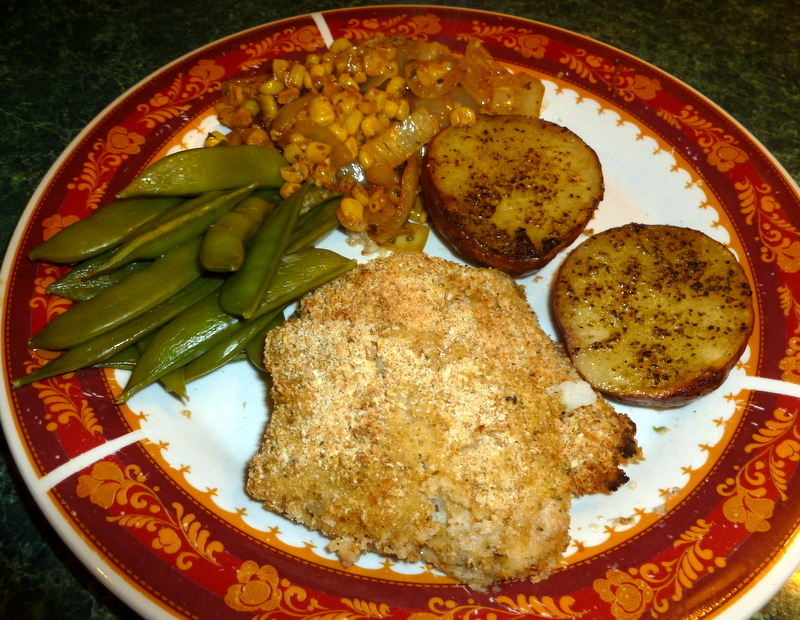 Here shown with Family-Style Baked Red Potatoes, Butter Fried Corn and steamed Sugar Snap Peas. This whole plate comes up to about 10 points. You got room for dessert! 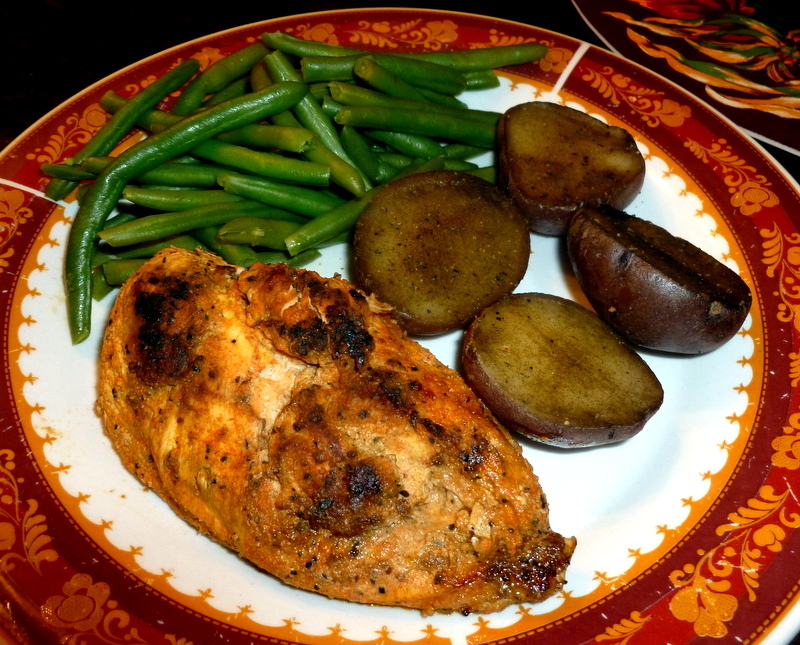 This is a nice, easy meal I make when I am pressed for time and I need something quick, but still low on points with lots of flavor. It's a family favorite. Serves 6. Spray a pot with nonstick spray and saute onion, garlic and mushrooms together, till just tender. Add the cream of mushroom soup and milk, mix well together. Then add the black pepper, parsley and lemon juice, mix thoroughly. Let simmer on medium covered for about 5 minutes. Throw in your chicken burgers. 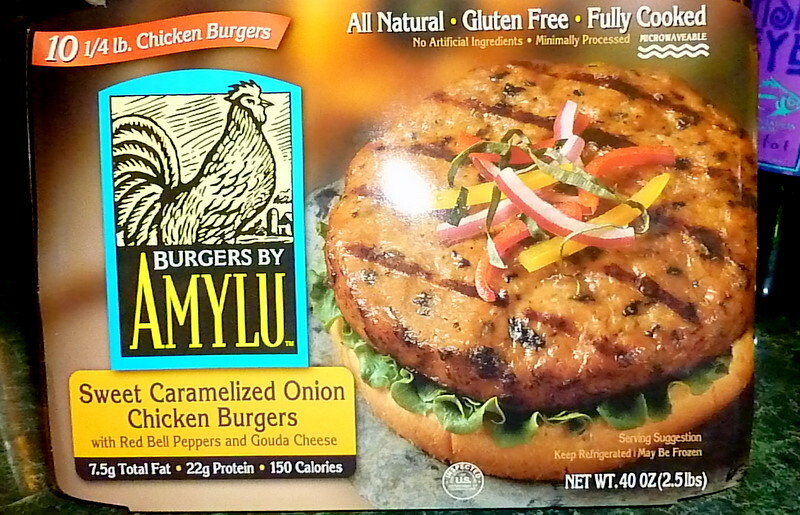 Personally, we love Amylu brand. It's yummy, and healthy! Only 4 points per patty. We get it at Costco. At about $ 11 for a 2.5 pound box (10 burgers), it's not bad . Make sure your patties are well covered with the sauce. Cover the pot and let simmer on medium for about 10 minutes. And that's it, it's done. Simple, isn't it? Only 6 points per serving. Yummy! 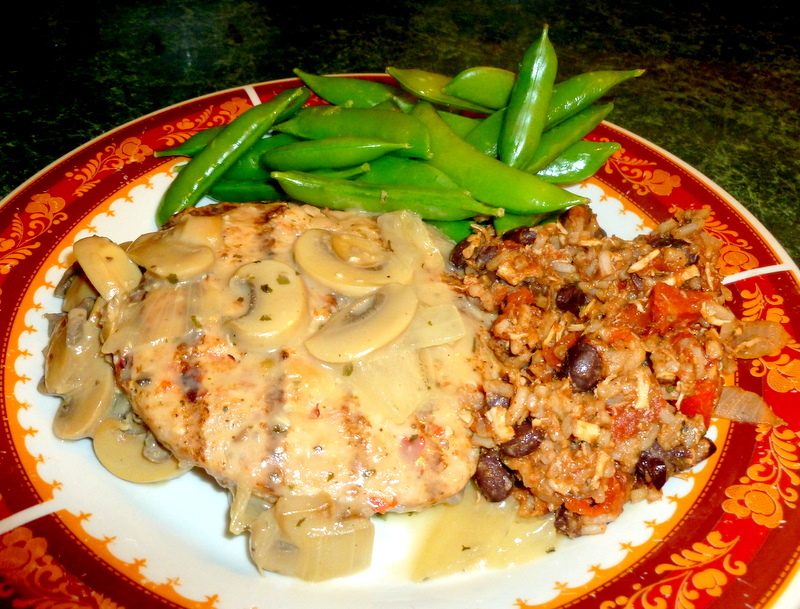 Here served with Mexican Beans and Rice and steamed Sugar Snap Peas. This whole plate is 10 points! I like making this dish when we have some leftover chicken from the night before. It's quick and simple to make, plus it tastes oh so good! Serves 6. Spray a pot with nonstick spray. Saute the bell pepper, onion and garlic together till tender. Add the chicken and cumin. If you are using fresh chicken and not leftovers, cook it till all the pink is gone. Add the tomatoes and green chiles. Cover and set heat on medium. Cook for about 10 minutes. 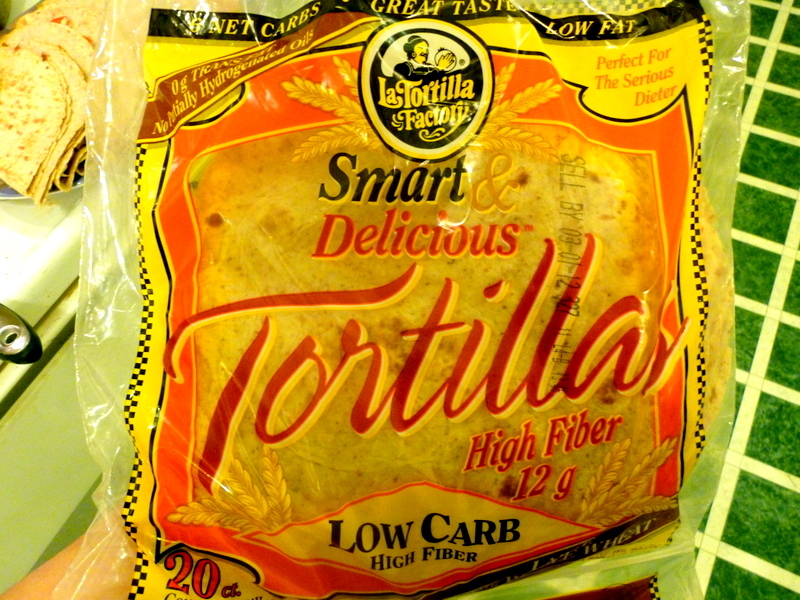 Before I forget, I use La Tortilla Factory Smart and Delicious Tortilla. 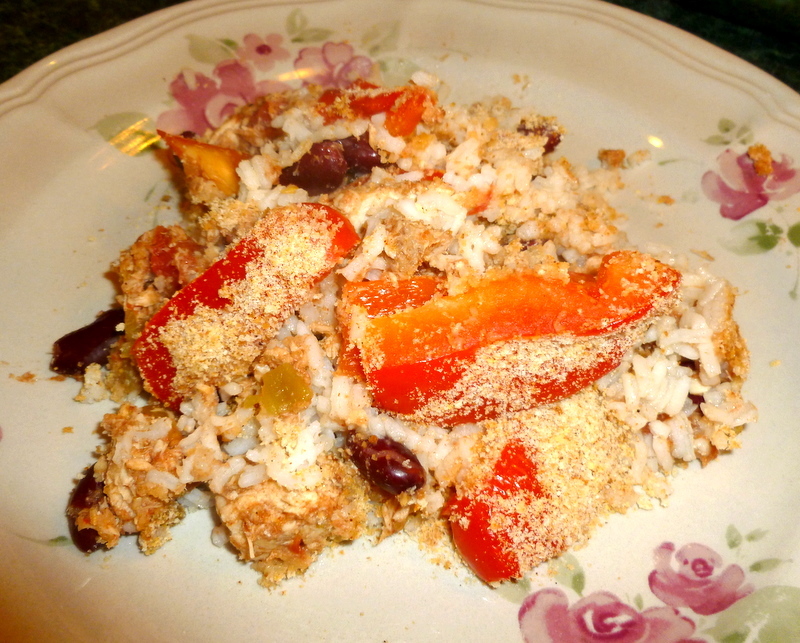 Only 2 points per serving, AND really high on fiber to fill you up! Good stuff! Spray a griddle with nonstick spray, and heat. 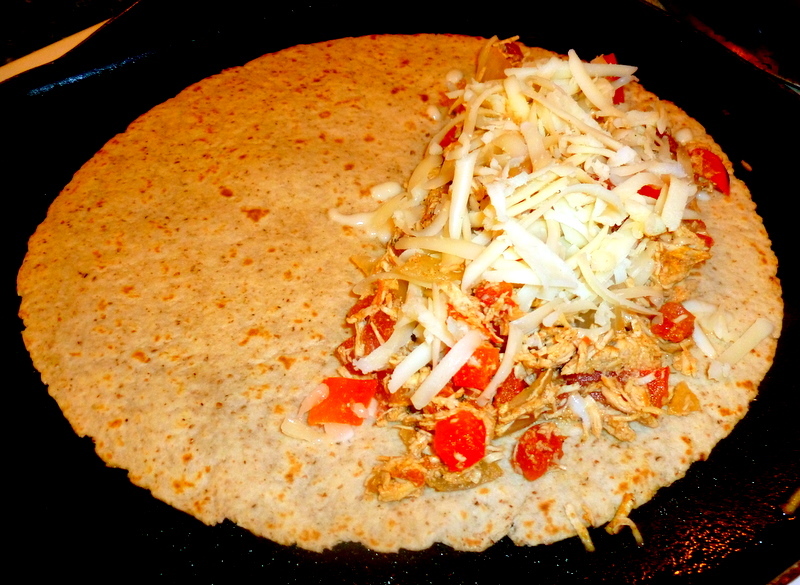 Lay a tortilla on it and spoon a layer of the chicken mixture on one side, and top with some cheese, like so. 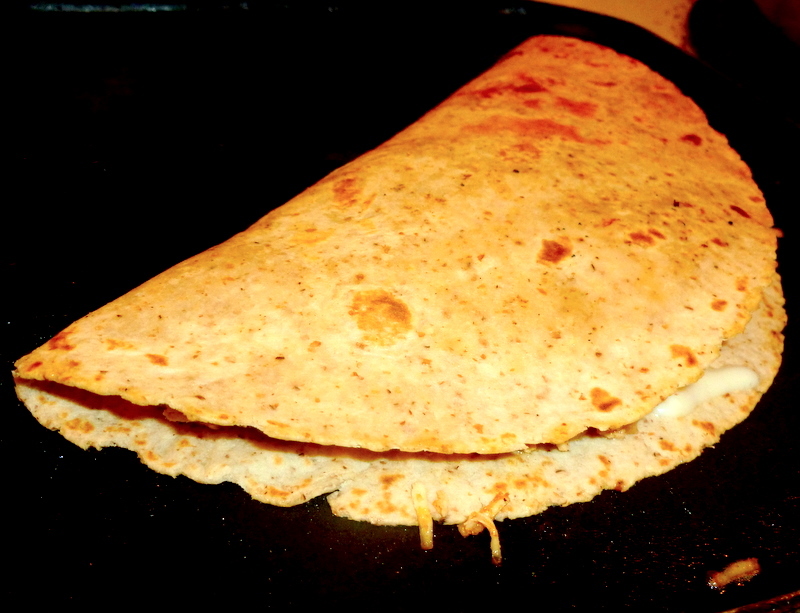 Fold over tortilla using a spatula, and press together. Cheese will melt and will act like a "glue" to keep things together. Flip over to the other side to heat, cook for a couple more minutes. And that's about it! About 5 points a serving, which is good news for you. Slice it in thirds and serve it with the salsa of your choice and sour cream, if you wish. 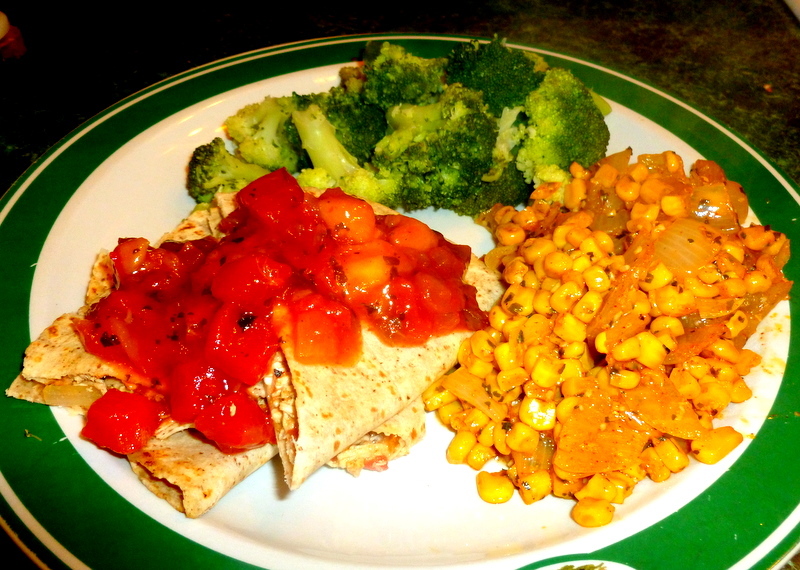 Here, I served it with mango salsa, Butter Fried Corn and steamed Broccoli. This plate is about 10 points. NO KIDDING! This is the way my family likes their potatoes. It's easy and really yummy! My husband calls it "restaurant quality potatoes". Try! Serves 6. Spray a 13 X 9 baking pan with nonstick spray. 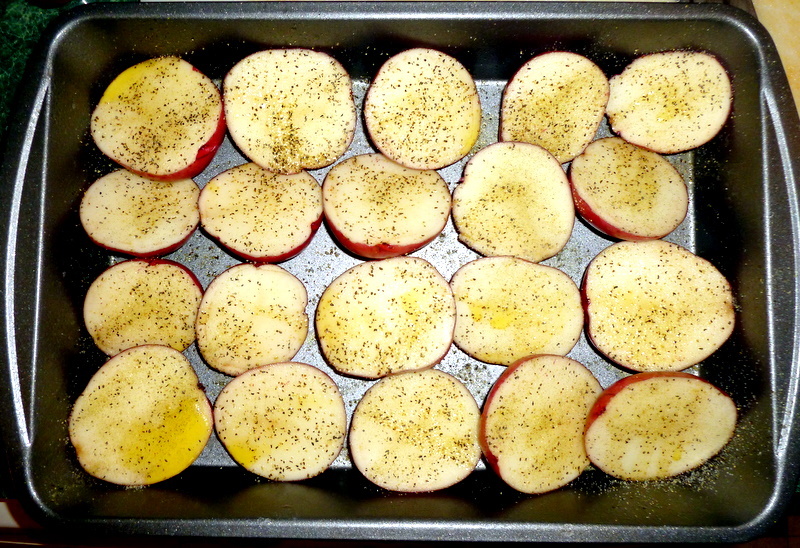 Lay your potatoes in and drizzle the olive oil over them. 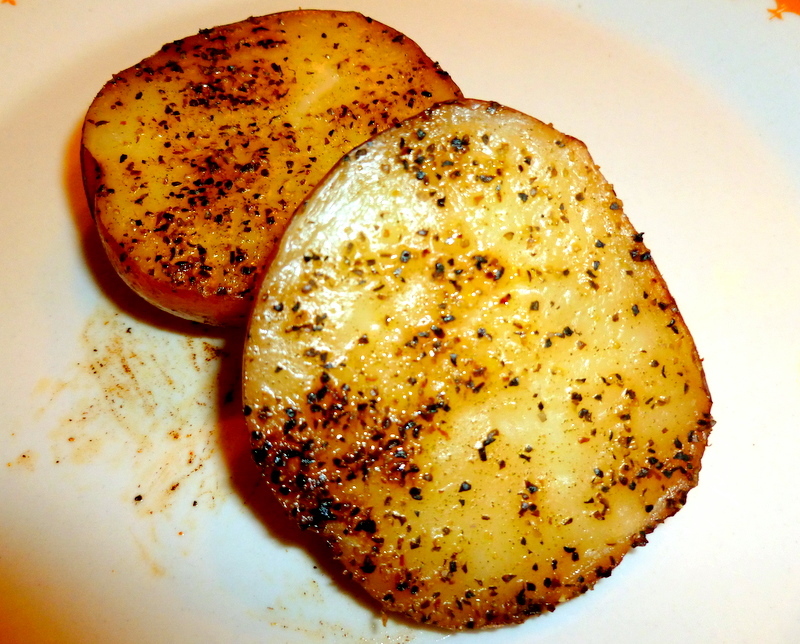 Now generously shake the Cavender's Salt Free Seasoning over the potatoes till covered. 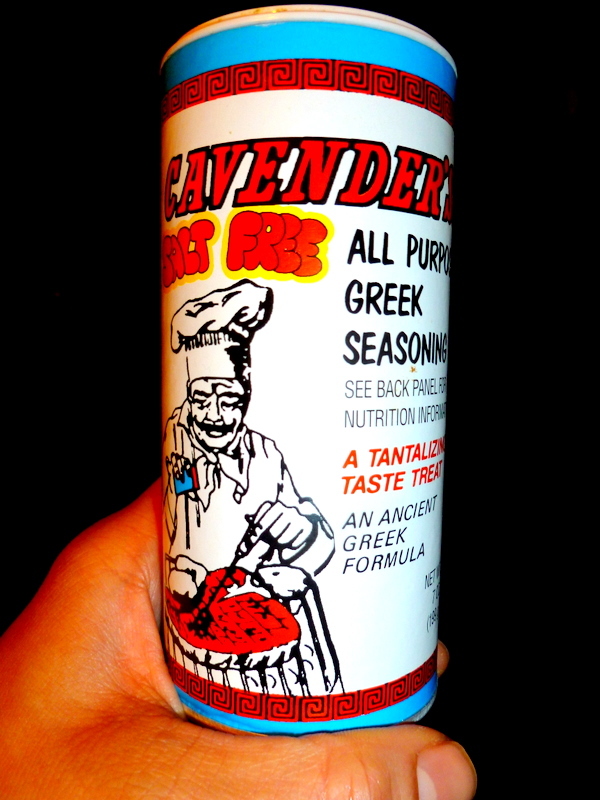 Now about Cavender's Salt-Free Seasoning. This is it. We just LOVE this! It's salt-free so no sodium. And it really makes things so tasty, just adds the right amount of zip to food! Plus it costs about $ 3.78 for 7 ounces, so you get a lot for your money. Trust me, it's dee-lish! Now cover your baking pan with a lid or aluminum foil, and bake in a preheated 400F oven for about an hour. That is it! Only 5 points a serving! Ok so you know, one serving is 2 whole potatoes. 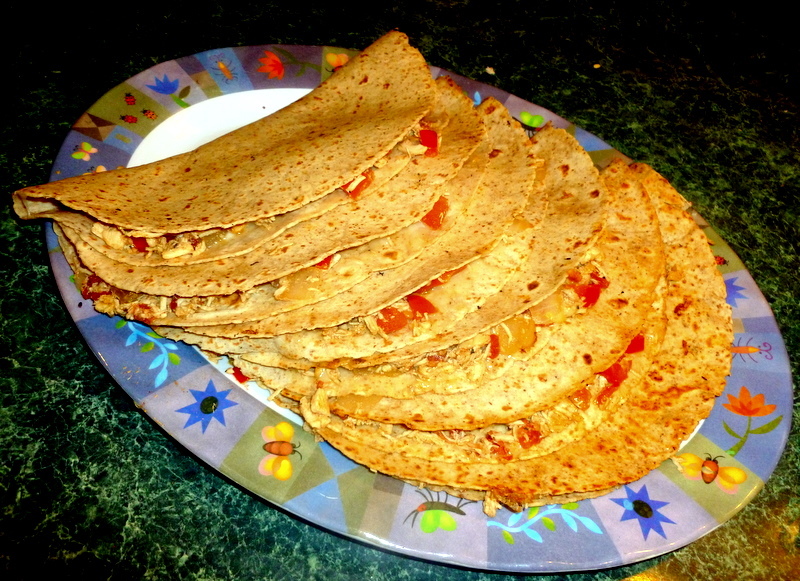 Healthy, tasty and simple to prepare. Busy mommies, take heed! Here served with Pepper Paprika Chicken, Broccoli and Baby Carrots. Can you believe this whole plate of food is comes up to only 7 points? Thought so. Wife to S. and Mama to 3 little girls. Living and loving it up!